Fundraisers are a great way to inspire your friends, family and community to rally around your love for Carolina Tiger Rescue. 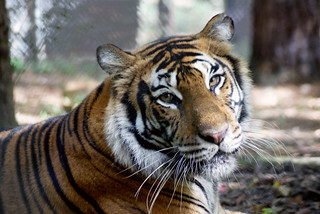 Not only can you make a significant financial contribution to help us care for our beautiful cats, but you can help us raise awareness about Carolina Tiger Rescue and our mission to save and protect wild cats in captivity and in the wild. Complete the online ”Personal Fundraising Form” (below). Download our Special Events Agreement Form. Sign and mail back the Special Events Agreement Form to: Carolina Tiger Rescue, 1940 Hanks Chapel Rd., Pittsboro, NC 27312, or fax to: 919-542-4454. Our Special Events Team will review the completed form and contact you to approve the fundraiser. Planning and coordinating a fundraising event can be an exciting and challenging experience. Because state law mandates that all charitable special events be registered with the charity, before you begin your event, please contact Susan King Cope at 919-542-4684 x 3009 or email.